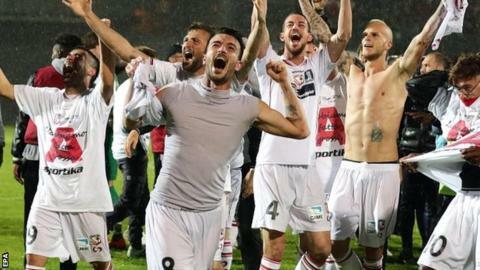 Small-town club Carpi will play in Italy's Serie A for the first time next season after completing an historic rise. Five years ago the club, whose stadium has a capacity of 4,144, was playing in the Italian fifth division. They were promoted to Serie B in the 2012-13 season and will now face giants like Juventus and AC Milan in Serie A. There are questions over where Carpi will play next season as Serie A rules require a minimum capacity of 20,000. However, special exemptions are sometimes approved. "It's been an extraordinary journey and I'm delighted with this promotion," coach Fabrizio Castori told Sky Sport Italia. "This team has improved step by step and these lads have a great future." The town of Carpi, in northern Italy, has a population of only 67,000. The original club was founded in 1909 and although Carpi were declared bankrupt in 1999, they were re-established the following year. Carpi confirmed their place in Serie A with four games remaining of the season courtesy of a goalless draw against Bari on Tuesday night. Former players at the club include Italian 2006 World Cup winner and former Everton defender Marco Materazzi. Has Rodgers' season been a failure?